When not helping people out in The Running Works, Mary represents Orion Harriers running club. She trains with Team Run-Fast every Tuesday at our track sessions and makes a cracking orange and polenta cake (although not at the same time!). The Mizuno Wave Rider has been my ‘go to’ road shoe for at least seven years now. The latest model, Wave Rider 18, lived up to and exceeded my expectations. The U4iC compound in the midsole keeps the shoes super light without compromising durability or cushioning. The fit itself is reassuring with a comfortable heel counter, a nice secure mid-foot and ample room in the toe box. The one-piece upper of version 17 has become a two piece on the 18. It is slightly heavier but has a lovely plush feel and seems to me less likely to rub. The look is also much improved and I love the green and black colour-way. Mizuno shoe laces seem to change in length with each new shoe. I found the lace length of the Wave Rider 18 just right for securing the shoe with a knot knot. They are not long enough should you want to use a double not. The laces are far too short on this model to be able to loop-lace to further secure the heel. not that this is something I need to worry about as they fit me perfectly. 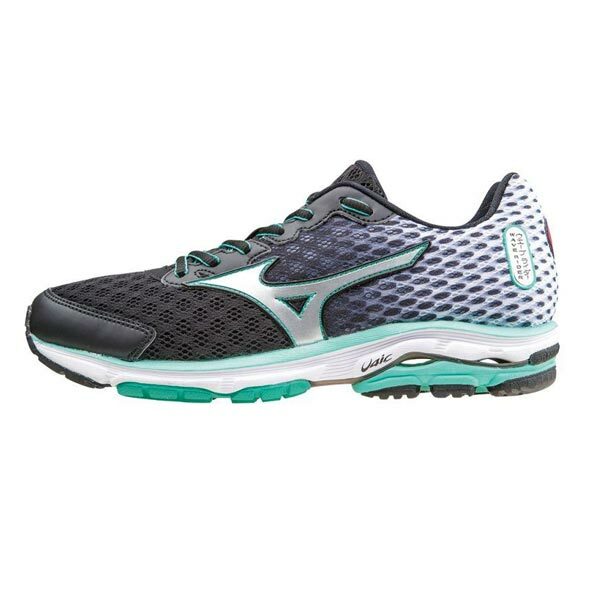 The Wave Rider 18 is a winner for me in the neutral running category. They’re a lightweight shoe you that you could wear comfortably to a track session, as I do. The have ample cushioning for road running and would be suitable for distances from a 5k to a full marathon. The best version of this shoe so far!